Today in the Court of Appeal, The Master of the Rolls (Lord Chief Justice Dyson), Lord Justice Richards and Lord Justice Sullivan handed down their decision dismissing the Appeals brought against the Department for Transport’s decision to progress with High Speed 2 (HS2) by an alliance of 15 local authorities, HS2Action Alliance and Heathrow Hub Limited. The three Court of Appeal judges considering the judicial reviews on HS2 case were divided on whether a Strategic Environmental Assessment (SEA) should have been undertaken for the proposed high speed line, HS2 and have granted leave of appeal to have the case heard at the Supreme Court. “The judges were split on whether a Strategic Environmental Assessment and an Environmental Impact Assessment should have already been done on a project that has been underway for over three years. But they agreed that the draft environment assessments which had been done didn’t match the directives, and gave immediate leave to appeal. “Simon Burns is proposing we spend £50bn on a railway which has no support from economists, massive criticism from rail experts and academics and no environmental creditials. That man has no right to lecture anyone about wasting taxpayers money. “We will continue our fight to make sure that the Government does not duck its environmental responsibilities over HS2. We can see from the Phase 1 Draft Environmental Statement that cost savings are the top priority rather than protecting irreplaceable landscapes for future generations. The Government must properly take the environment into account. “There is little case law on the specific point of law on which we lost. We are confident that our position is a strong one and we are pleased that the Court has allowed our appeal to the Supreme Court. “It’s concerning however that we have to go to the highest court in the land to make the Government give the environment the respect it deserves”. However the equally important focus must be on MPs and how get them to work individually and collectively to convince those who are in the sceptical camp and there are a lot! The Court of appeal relied in its findings of judicially preconceived notions on the ethics and honesty of Govt and its freedom from undue influence from lobbyists and those with vested interest. Something that Govt is ‘investigating’ after evidence to the contrary. Specifically that Ministers will to act fully in according to their code. We must trust that the Judiciary are correct on this aspect l ordinary people cannot influence this aspect of self-government by parliament. There is as yet no fully indepen body as was set up re pay awards. It seems from Press coverage that our Minister acts to dissemble the rational, contrary voice using untruthful statements about the use of tax payers money……..whilst proclaiming democratic values and appearing to support the claiming of costs from the general public ( in dissent); essentially a political harmless piece of spin whilst suggesting that we desist in our opposition and ‘assist’ in developing the scheme which is inevitable. Dark arts indeed. Democracy indeed. Meanwhile evidence in France and Spain indicate that real work and careful planning rather than media manipulation are needed to create a safe and environmentally sound system. Our Court of Appeal (in their findings) entrust matters to the Govt. relying on their professionalism and freedom from lobbyist spin or other influences. In light of tragic events in France, Spain and near forgot Gerrards Cross it is important to remember that Parliament has been informed by concerned individuals about their concerns and indeed how HS2 own original engineers viewed the safety of the route. Reading Stop HS2 twitter I was dismayed to see some pro HS2 voices uses the concerns about the Spanish disaster as a means to continue governent inspired propaganda;rather than view the concern appropriately ( such was the propoganda’s designed power) . I hope others in Parliament are not so brainwashed. This makes significant points about the way in which Hs2 ltd and Ministers address safety issues that arise from the work of professional consultants they appoint and events they are conversant with.. The Appeal Court did not address the matter of information and safety; entrusting that to the ‘professionlism’ and freedom from prejudice of Govt and Parliament. It is not possible for Parliament to ignore this material submission or the significance of the evidence that it has therefore ‘considered’. They must answer it adequately. I suggest that most of those in opposition to HS2 in the main are opposing on sound grounds and because HS2 was a pre-election stunt run wild. Indeed most parties are attempting to address the traumatic and damaging situation with creativity. Unlike the Minister whose comments released to the press show his complete denigration and seeming ethical insouciance. After all it is a citizens right to lawfully protest and their ecal duty to contest that they consider contrary to the common good. 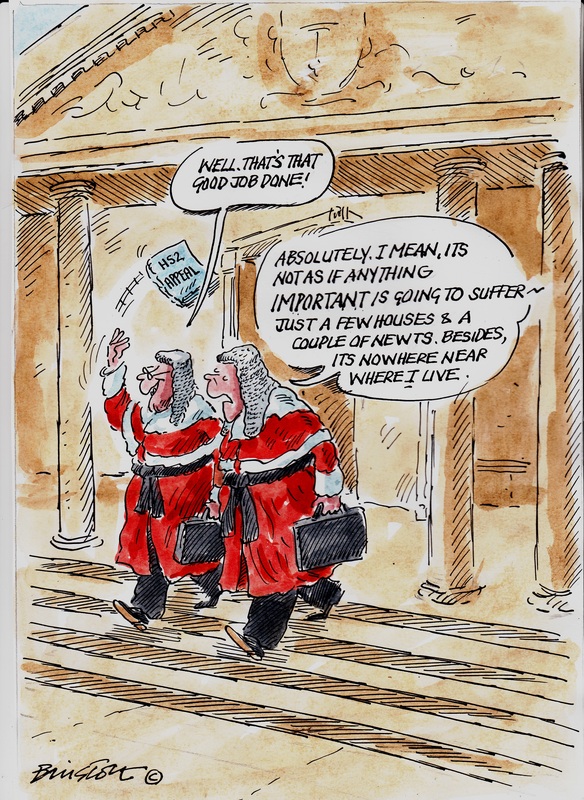 “This is the second time in four months a court has rejected attempts to derail HS2…….Parliament is the right place to debate the merits of HS2, not the law courts . . . I urge opponents not to waste any more taxpayers’ money on expensive litigation and instead work with us on making HS2 the very best it can be. 1. Why was Route 3 of Phase 1 chosen by ministers against the advice of their route proving report provider and engineer Ove Arup? 2. Route 3 has significant geological, geotechnical and hydrological problems associated with it. The Route proving engineer highlighted these issues in the appendices to the route proving report using statements to describe the strata such as “vulnerable to shrinkage and swelling”, “material has low strength and high moisture content”, “contains groundwater and will be troublesome for earthworks slope stability”, “careful handling required”, “slope instability problems” etc etc. Why has HS2 and the government chosen to develop a route that comes with such significant engineering complexities and hydrological dangers? 3. Water loading of any structure is the great unknown in design calculations. The amplitude of the hydrology in the misbourne basin together with strata (highlighted above) will amplify the dangers created by the high resonance high frequency vibration associated with such trains. The 2005 Rail Tunnel collapse onto the mainline at the nearby Gerrards Cross was blamed on water loading undermining part of the struture. There is precedence of tunnel collapse in low frequency low resonance structures in the nearby area which can only be exacerbated by the high resonance design. 4. Why has Ove Arup been replaced by Parsons Brinckerhoff and Atkins as design engineer for the Misbourne Valley stretch of the line. 5. Why has the DFT justified this decision by stating Ove Arup were only operating in an “advisory role” and Parsons and Atkins are operating in a “delivery role”. You raise some interesting points of concern, Paul. As for your first question, I think that the existance of the old Great Central trackbed may have inclined the Government towards this route. HS2 published a map of alternative routes , looking like spaghetti on the page , and convinced the government which seemed best ,according to the criteria they had been given. Whether we are convinced or not, they went ahead , as their publications explain. Had they stuck to more of the G.C. main line route, together with a more modest top speed design, then I think the result would have achieved most of what was needed to provide extra fast capacity with less potential damage en route, and have made it easier to include one or more intermediate stops for a minority of trains, thus giving access and effectively answering the “all the pain for no gain” argument. Concerning the geology, sur ly experience with the Channel Tunnel, HS1,through the North Downs, the tunnels from Thurrock under the Thames to Ebbesflete, and under East London, not to mention Crossrail and the Jubilee tube crossing and recrossing the River should give confidence that the builders can deliver. Even the existing Met/ Chiltern line through the Misbourne valley includes both tunnels through the chalk and embankments and , together with the later Wycombe route -also tunnelled and embanked- was used not just by local passenger services, but by fast express trains to and from the Midlands and the North and vast quantities of goods, millions of tons of coal to London and mail, fish newspapers and so much more. Thanks for that John. The aquifers and rapidly changing geology of the Chilterns I do believe is a complexity. (all complexities can be engineered at a cost. Arup did not approve this route and the contract was awarded elsewhere who said they could achieve it. Do you know the back story to this? Area is known for sink holes etc. This is UHS.rail so stabilty and alignment are significant. I was thinking attaining the stability will require complex egineering. The Tesco tunnel was similar in nature to the cuttings and cut and cover tunnels planned. Changes in hydrostatic pressure was apparently the force that damaged the Gerrards Cross design. Minister Burns keeps referencing the success of HS1 and favourably comparing the HS2 to it. HS1 of course followed the motorway and avoids the AONB. (where I lived in the Kent AONB about 6-7 miles from the track and 500 feet above) it and it was still quite audible (but low frequency of trains),sufficient depending on the wind to ruin the peace of Summer. Do you now what the preferred Arup route was and why they had engineering concerns re this route? The current route will be devastating for the AONB and the populations along the route. The HS2 sound maps are quite misleading and inaccurate. Lord Justice Sullivan has analyzed position and case-law (including lots of EU caselaw) very precisely and succinctly. The other two Hon Judges raise issues that will be very relevant to the nature of the parliamentary processing of the Hybrid Bill. It would be interesting to consider how the use of Parliamentary Whips to push the Hybrid Bill through would relate to their findings.